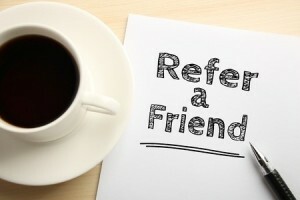 An alternative to asking customers for referrals is to incentivise them to refer you. You need to be sure that the customer is happy about the business they have done with you. Once you are, it’s worth considering offering incentives. The advantages are that you can reach many more customers than you could through talking to them. Usually, you will generate a higher number of referrals. The disadvantages are that it will cost you money and you need a slick, efficient process in place. You also need to consider what incentive you want to offer as it has to be of value to both yourself and your customer. ABC Accountants go networking to find new clients. They spend £1,500 in fees and meeting costs each year. They also spend 150 hours a year at network meetings and follow up one to ones. That is time they could have spent working for £20 an hour. That means their total networking costs are £4,500. Networking has proved successful for them. On average, they get 20 new clients a year through this. 20 new clients for a total cost of £4,500 means it costs them £225 for every new client they get. That’s their cost of acquisition. Once you understand your cost of acquisition you can plan your incentive. You now know the most you would want to pay as an incentive for a referral. It should be your lowest cost of acquisition otherwise it isn’t worth doing! Next you want to think about what would be valuable to your customer. This should be something that is worth more to your customer than it would cost you. For example, a product sells for £100 and costs you £30. Offering 10% discount for each successful referral would be worth £10 to your customer. It would only cost you £3. Compare that with offering 10% cashback for each referral. The value to the customer is still only £10, but your cost has jumped to £10! Take ABC Accountants as an example again. They offer their customer access to a software platform. It simplifies their bookkeeping and saves them time for £20 a month as part of their normal service. ABC pay an annual licence fee of £200 and have 200 clients so the cost to them per client is only £1. They decide to offer 50% discount for a year on access to the software for every successful referral. The value to the client is £120. The cost to ABC is £1 plus the £120 lost income. This will be offset to an extent as clients who didn’t use the software before will take up the offer. So, at first sight, the cost of acquisition for ABC is £121 for an incentivised customer referral. That looks lower than the £225 cost of acquisition through networking. It gets more complicated than that though. To keep encouraging referrals, they don’t limit the number of referrals per client. In simple terms, if a client refers 3 new clients in a year, they get the 50% discount for the next 3 years. This has a hidden benefit. It increases client loyalty. Now it’s harder for rival firms to compete against them on price, so they lose fewer clients. Over time, there will be zero cost to ABC. To summarise – incentivising customers to refer is something you should consider. Be careful to work out your cost of acquisition and compare it to other methods. Check the value to your customer and the cost to your business. Important note: Once you start offering incentives, your customers will come to expect them. Make sure you keep them going! Keep in touch for regular advice and practical examples about customer experience. Get in touch to see how we can help your business. Ask an expert if you have a specific question about customer experience. Not convinced about customer referrals yet?